The City of Espoo has strong and long-standing working relations with the City of Shanghai. The cities concluded a sister city agreement in 1998. The collaboration has taken some time to develop, but as a result of the long-term efforts we have been able to move from words to action. To mark the importance of this partnership, Espoo is the first city ever to have been invited to the biggest technology fair in China as a guest of honour. “We have learnt from experience that Espoo has very special significance to Shanghai, in spite of the fact that the City of Shanghai has more than 80 sister cities in different parts of the world. We are now deepening our collaboration even further,” says the City of Espoo’s Director of Economic and Business Development Tuula Antola, leader of the Finnish delegation to Shanghai. Together with Ms Antola, the City of Espoo will be represented in Shanghai by Manager for Economic and Business Development Harri Paananen and Head of International Affairs Fanglan Tao. Other members of the delegation include VTT Technical Research Centre of Finland Ltd, Aalto University, Team Finland, Helsinki Business Hub and Aavi Technologies Ltd. The relationship between the two cities is highly valued in China, and Espoo was very well received on the visit to Shanghai. The Finnish delegation met with representatives of the top political leadership and management of Shanghai. The technology fair and Finland and Espoo’s visibility fortunately occurred after the meeting of the presidents of Finland and China two weeks ago. Finland’s visibility at the fair was good. For instance, the high quality of the education system in Espoo and the whole of Finland and Espoo’s ranking as the most sustainable city in the EU have attracted interest in China. In a study conducted last year, Espoo was found to be the most economically, socio-culturally and ecologically sustainable city in Europe. According to a recent follow-up study, Espoo has maintained its position as the top city in Europe in terms of sustainability. “It is obvious that the Chinese have done their homework on Finland after the President’s state visit. Shanghai wants to learn more about sustainable growth and Smart & Clean technologies. In spite of the fact that in Shanghai everything is a hundred times bigger than in Espoo, we are equal when we try to solve the challenges of our growing and developing cities. It is in the interest of both cities to increase trade cooperation between the two countries,” Antola concludes. “When we consider the challenges that we have to solve, it is easy to see Espoo as a partner to a city like Shanghai. Apart from technical solutions that support sustainable growth and assessment of their environmental and cost impact, we can also offer urban planning to support communication between the different parties,” says Mika Toikka from VTT Technical Research Centre of Finland Ltd. 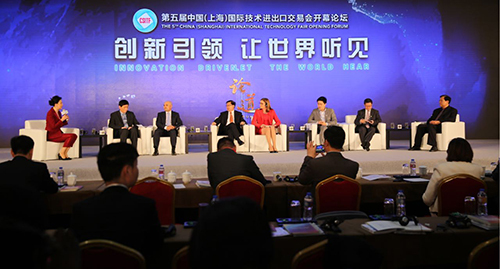 The future goals of China include open innovations, protection of intellectual property and sustainability. In these areas, China has much to learn from Finland. “Competence is Finland’s most important natural resource, and innovations belong to everyone. We believe that there is enormous potential in our collaboration with Shanghai for the whole of Finland. We want our excellent relationship with Shanghai to benefit the whole of Finland,” Antola says. The China Shanghai International Technology Fair is being held on 20-22 April 2017 in Shanghai. Along with the countries that have received an invitation to the fair, Espoo is the first city that has been invited to the fair as a guest of honour. took part in the panel discussion at the Technology Fair.